David Crabb is a medical doctor that has been involved in alcoholism and liver research since the early 1980’s. This has included the study of effects of ethanol on intermediary metabolism in the liver and adipocytes, using cultured cells, and in vivo animal and human models. In addition, he has been closely involved in studies on the genetics of alcoholism, the epidemiology of alcohol use disorders, and human and animal studies of responses to alcohol, through his role as Director of the Indiana Alcohol Research Center. The Center has been funded for three decades. 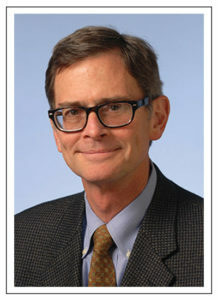 Dr. Crabb’s involvement in the care of patients with alcoholism, research on pathogenesis of alcoholic liver injury, and his hepatology training led to involvement in organizing a multi-center consortium funded by the NIAAA to study the natural history and treatments for alcoholic hepatitis as well as performing mechanistic studies on the pathways leading to severe liver injury in human subjects. In addition, Dr. Crabb has been involved in implementing screening for hazardous alcohol use (screening, brief intervention and referral to treatment) across the Eskenazi Health system.